Married to Martha: Where in the world is Farmer Bob? 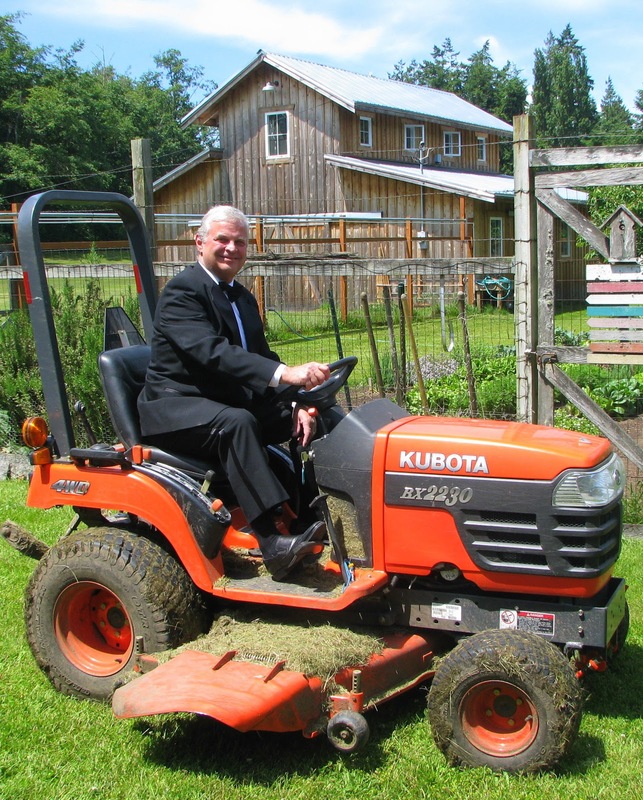 Farmer Bob's double life: Tuxedo on a tractor! Photo by Nathan Hambley. Who knew I'd end up being Married to Martha? Of course I mean Martha Stewart, the doyen and maven of all things relating to cooking, entertaining and creating beautiful and inviting spaces and places. My hubby is Bob Frause, aka Farmer Bob. We were married on Whidbey Island in August 1974 and moved from Seattle to the island one year later where we bought a 1930s house on three acres in Langley. Since that time, we've added a garage, storage shed, barn with loft and most recently, a dandy new chicken house. And we've expanded our home during the three-plus decades, having just completed the fourth (and final!) renovation of our main bathroom. 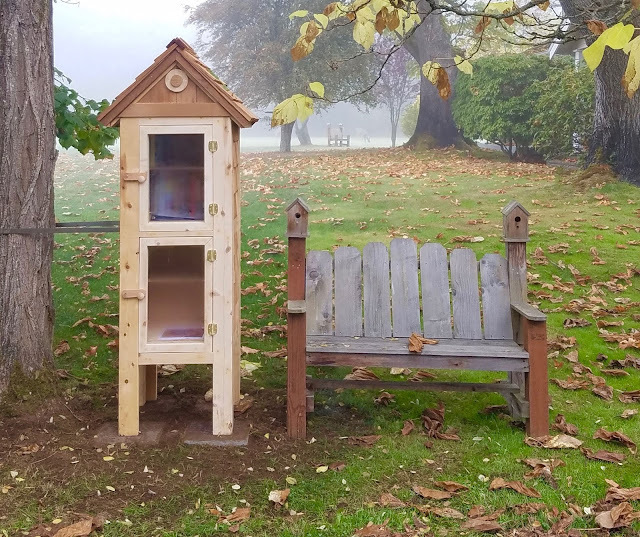 All our house and garden projects are for the most part the handiwork of Farmer Bob, who weekdays is Chairman/CEO of Frause, a communications agency with offices in Seattle and Portland. 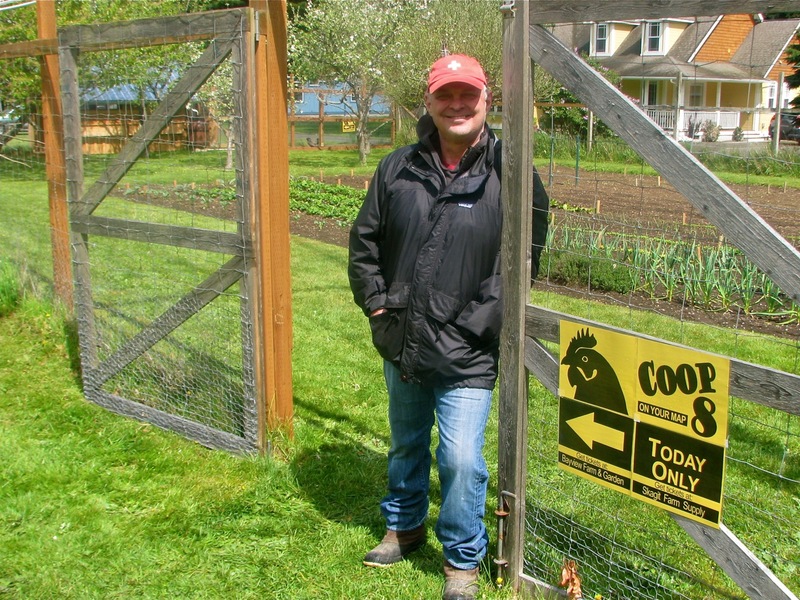 Although he enjoys his work as a professional PR guy in the city, I think he's happiest on the home front, whether carving a homegrown turkey for our Thanksgiving dinner or out in his garden awaiting visitors during the annual Rock 'n Doodle Chicken Coop Tour. The only thing he dislikes is there aren't enough waking hours to get it all done. 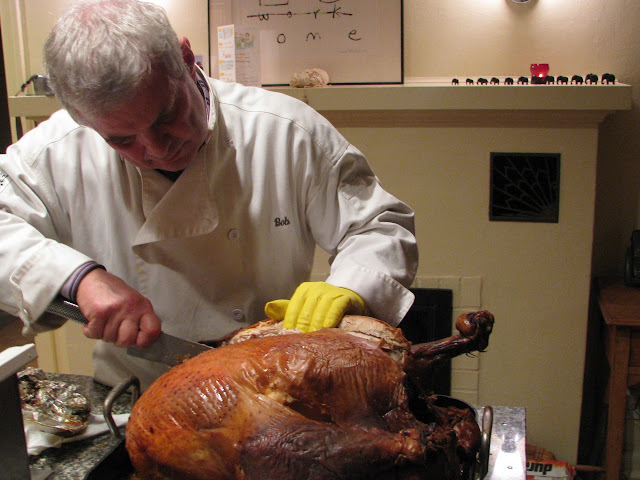 Bob carving the Thanksgiving turkey. Photo by Sue Frause. Among my numerous writing gigs in the past two dozen years was a Seattle P-I blog that I wrote from 2006-2012 called Whidbey Island Life. It was all about my life on the island, and outside of Langley politics, the most popular entries were my Cookin' With Farmer Bob posts. They were devoted mostly to Bob's cooking and gardening, and included recipes along with my photographs. I admit to missing my musings about Farmer Bob since suspending the blog four months ago, so Married to Martha: My Life with Farmer Bob is the reincarnation. In addition to cooking and gardening posts, I'll include my hubby's handyman stuff, along with anything else that strikes my fancy. 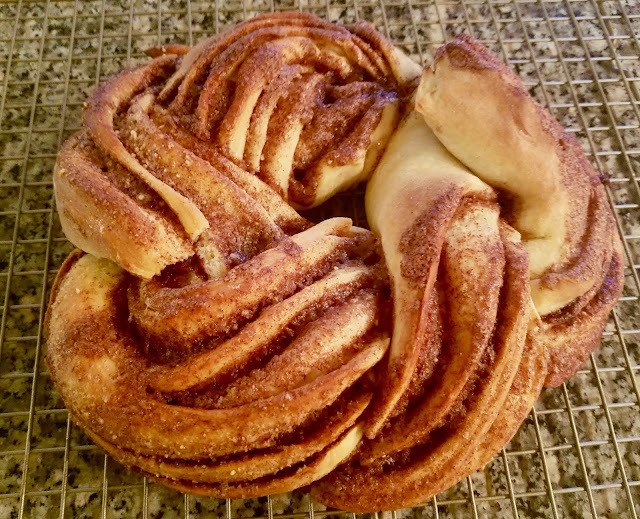 I'll also be revising and updating some of the original posts that ran in the P-I, especially the seasonal recipes that coincide with what's growing in our Pacific Northwest gardens. I look forward to sharing Farmer Bob's adventures with you. Welcome to Married to Martha! Looking forward to this blog with great anticipation and interest Sue! Ah, good to hear. It's a natural progression ... and has been in the works for awhile. The time was ... ripe (just like our peaches)! Thanks. Glad you're back in the saddle! Thanks, Kim ... love how things morph and change in our new world of communications. Out of my P-I blog about Whidbey Island emerged Farmer Bob who now has his own blog, Married to Martha! Glad he's such a good sport about it all :-). Just discovered your new blog. Looking forward to more of your musings.